The U.S. Department of the Army's move to halt construction of the Dakota Access pipeline near the Standing Rock Sioux Reservation has given new hope to Indigenous leaders in Canada opposed to oilsands extraction, with some vowing to adopt tactics used by protesters south of the border to block construction of Kinder Morgan's Trans Mountain pipeline. "Our people are in Standing Rock. They're quite prepared to take to the streets in the north," Ontario Regional Chief Isadore Day said in an interview with CBC News. "We definitely see parallels. We've got the same issues, they're the same companies and they're the same corporate interests that we're having to deal with." The events at Standing Rock, N.D., where protesters opposed to the pipeline at times faced police rubber bullets and water cannons in frigid weather, seized attention on the opening day of the Assembly of First Nations' special assembly Monday. Hundreds of chiefs from across Canada are gathering in Ottawa to discuss progress on the Indigenous front a year after the Liberal government took office. Quebec Chief Serge Simon said the protests in North Dakota send a clear message to Prime Minister Justin Trudeau and his cabinet colleagues who last week approved the construction of the Trans Mountain pipeline expansion and renewal of Enbridge's Line 3. "We're making it clear to the colonizing government that you're not going to get away with this," he said. "We have certain rights and we will assert them." 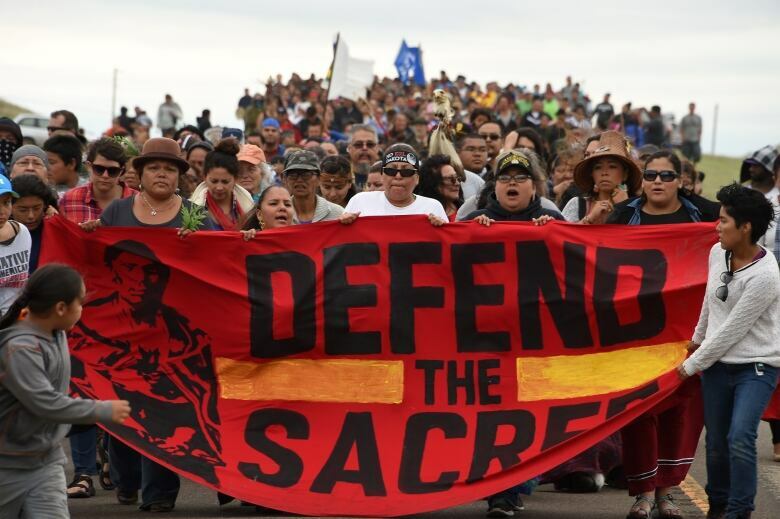 National Chief Perry Bellegarde said the decision to halt construction of the North Dakota pipeline at Standing Rock was a "victory" for those who stood strongly against the 1,886-kilometre pipeline that would run from the Bakken oilfields to refineries in Illinois. "I know from the AFN, we sent down people, we sent down resources, we phoned and we wrote letters as well. I think right now there is a feeling of jubilation because, really, it's all about the water," Bellegarde said in an interview. He added that the U.S. government made a "really good decision" to push the pipeline proponent, Energy Transfer Partners, to pursue an alternative route that does not run through an aquifer. The $3.8-billion US project, which is already mostly built, would have crossed through sacred Indigenous ground and run under Lake Oahe, a Missouri River reservoir. 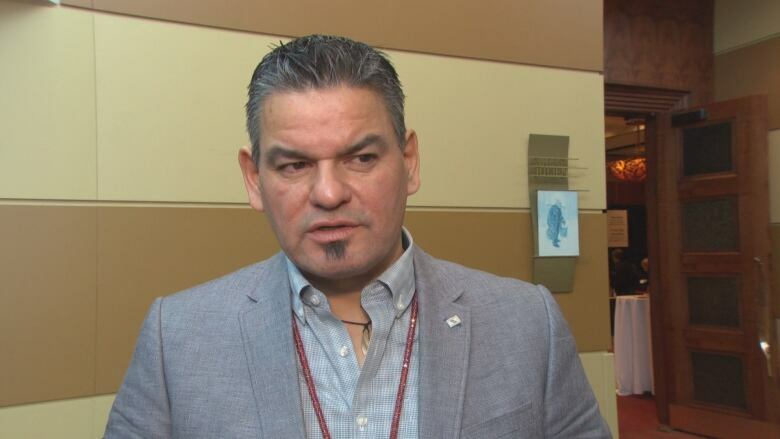 British Columbia AFN Regional Chief Shane Gottfriedson, who supported the Trans Mountain pipeline when he was the chief of the Tk'emlups Indian Band near Kamloops, said he expects Standing Rock-like protests to move across the border, but he's hoping cooler heads will prevail. "Pipelines are a very emotional topic for many of our people because of the disasters that have occurred," he said, referring to the spill of diluted oilsands bitumen from an Enbridge-owned pipeline into the Kalamazoo River in Michigan in 2010. Gottfriedson was not as full-throated in his support of the pipeline Monday, preferring to stake out the middle ground now that he is tasked with leading all First Nations' chiefs in British Columbia. "There's a 50-50 split in B.C. It's not for me to advocate one way or another," he said, despite his past efforts to sign a mutual benefits agreement with Kinder Morgan. "My job is to find balance and make sure we don't end up with another North Dakota pipeline incident." 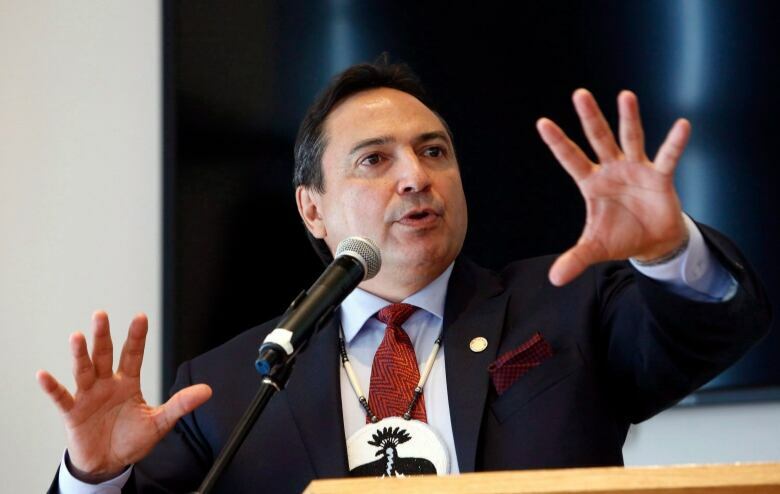 Bellegarde has said chiefs are afraid to speak out and support pipeline development because they have been stigmatized by some hard-line protesters. Natural Resources Minister Jim Carr was asked last week about the proliferation of protests. He said that if activists were not peaceful, "then the government of Canada — through its defence forces, through its police forces — will ensure that people are kept safe." "We have a history of peaceful dialogue and dissent in Canada. I'm certainly hopeful that that tradition will continue. If people determine, for their own reasons, that that is not the path they want to follow, then we live under the rule of law." Some chiefs said Monday that Carr's remarks sent "alarm bells ringing" throughout First Nations communities. "It really has us questioning the competence of that minister … those are knee-jerk comments, and we want to send a message that those won't be tolerated. I'm having a hard time trusting him now," Day said. When asked again Monday about his remarks, the Winnipeg-area minister said the government strongly supports the rights of people to protest these "controversial decisions." He strenuously denied his remarks should be interpreted as some sort of threat. Bellegarde said First Nations leaders are hoping to avoid a "national crisis" similar to the 1990 standoff at Oka, Que., when the Canadian Forces and the Quebec provincial police were called in to the Mohawk community to resolve a land dispute. He said the minister has to be "more balanced" in his comments when discussing First Nations people and their right to protest. Simon said Carr's comments were "highly irresponsible" because of the historical significance of invoking the military as a bulwark against Indigenous protests. "I come from Oka. I've had experience with the military and being surrounded by police," Simon said. "My interpretation was that it was absolutely a threat." Stand with Standing Rock demonstrators shut down major intersection in Thunder Bay, Ont.